Want to get away in the dead of winter and escape Februarys wrath? Want to dive Bloody Bay Wall? The 10 day trip includes Lodging, 3 meals a day, 3 dives a day and 3 cocktails, beer or glasses of wine a day. Diver Cost: $3034.00 NonDiver cost: $2433.00 (*Gratuities, Flight and any adult beverages past the third one is on you*) Nitrox is also available but not included and night dives are $65.00 payable to the resort. Stop in or call to reserve your seats, cash or check please! Diving starts on February 13th so plan flight to arrive 2/12/19 and depart 2/23/19…..I will post my flight schedule when it becomes available (180 days prior to departure date) so you can use points or miles to get your flights. If the weather is good and seas are flat we will attempt to steam out to Cayman Brac to dive the Famous Ship Wreck “Russian Frigate 356 – MV Capt. 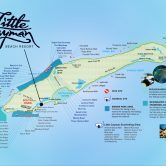 Keith Tibet’s” (*a $35.00 upgrade to go to Cayman Brac) Definitely the most popular reason new divers come to Cayman Brac is to dive the famous Russian Destroyer. She was purchased and sunk on a sandy plateau off the northeast end of Cayman Brac September 17, 1996. Jean-Michael Cousteau, a marine biologist and strong advocate for reef protection, was present for the sinking. In fact Cousteau, donning full scuba gear, rode the ship as it slowly sank to its final resting place. Slowly time is changing the wreck. Today she is loaded with corals and sponges. Fish ranging from the small secretary blenny to the goliath grouper live in her dark recesses. She is commonplace for moray eels, scorpion fish, and hawksbill turtles. Often large permits and ocean triggers are seen swimming the blue waters around the site. Even the sand holds a plethora of life; cushion starfish, garden eels, and thorny sea cucumbers to name a few. The location usually has 100’ plus visibility and no current. The stern sits in approximately 60’ and the bow in 85’ making it a shallow wreck dive and a photographer’s dream. Her 5” canons can be seen in magazines the world over.